There is every reason to believe that the Islamic Republic's days are numbered. The current government, lorded over by the religious supreme leader, Ayatollah Ali Khamene'i, and his Guardian Council of aging mullahs, who can overrule any policy change by the pseudo-elected president, seem wildly out of touch with the general populace. Not only are the youth of Iran—some 70 percent of whom are under the age of thirty—chaffing under the "guardianship of the Islamic jurists" (velayet-e-faqih)—but so is the economy, due to sanctions imposed by the West in response to the regime's insistence on pursuing its nuclear program. Inflation has long been out of control and trade and tourism a tiny fraction of what it could be, and yet the establishment has on the whole shown little interest in sacrificing militant, revolutionary principles for economic, and indeed, political expediency. Can this approach be sustained in view of the tightening economic noose around Tehran, and at what cost? Tensions between the mullahs and the West are ratcheting up. 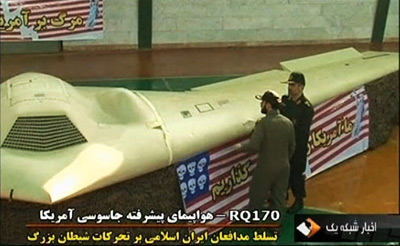 The downing of a U.S. spy drone was both a feather in the cap for the ayatollahs and a warning that Washington and its allies may soon seek to exert even greater pressure on the Islamic Republic. The replacement of a relentlessly Islamist regime—emerging as it is in competition with Turkey as the primary regional superpower—with a liberal, secular, democratic government that will eschew domestic repression and international subversion is certainly attractive. And it is not unprecedented, for Iran long struggled for constitutional and democratic rule. The constitutional revolution of 1905 was the first of its kind in the Middle East. Even the 1979 revolution, customarily referred to as the "Islamic Revolution," was in fact, initially, the result of a confluence of agitators: republican, nationalist, Marxist, and Islamist. But in the months and years following the flight of the shah and Khomeini's triumphant return, the ayatollah wrest control from the liberals and progressives, and through a brutal campaign of street violence, assassination, intimidation, and expert propaganda, crushed any opposition to his totalitarian ideology. Any visitor who spends significant time in the country will find ample justification for the Iranians' reputation for open-mindedness, artistry, intellectualism, and an almost fanatical reverence for culture. The most popular poet in Iran is Hafez, a national hero who is more readily quoted by most Iranians than the Qur'an. His poetry is full of wine-soaked revelry, unrequited and requited love, and a palpable hatred of religious hypocrisy and austerity. Indeed, even after decades of repressive Islamist rule, Iran is still full of apparent contradictions. It is run by a highly moralistic, puritanical clergy, yet cannabis and heroin are more freely available than in most Western countries; a country where producing music with a lone female voice is illegal, yet relatively early-term abortion is not; where most people are constantly on guard against expressing true political opinions, yet one will find an old woman who will loudly shout "Long live the shah! "; where nepotism reigns at almost every level of society and wealth and power go hand in hand, yet many of its most powerful political figures were three decades ago "riding donkeys in the provinces" as one Tehran resident put it. Advocates of the Islamic Republic's imminent demise point to the small semi-nationalist, Zoroastrian revival burgeoning among the youth of Iran. The Faravahar, the symbol of the religion, is a common sight on key-rings and hanging from rearview mirrors. For some it simply represents Iran and its past glory. But for others, it is a real spiritual alternative to Islam. As Ali-Reza, a construction worker in his fifties from south Tehran told me: "My grandparents were Zoroastrian, but my parents were forced to convert. … We are still Zoroastrian in our hearts, but in Islam, if you change your religion, they kill you," he adds, followed by several expletives. But one must be careful not to get carried away with this narrative. For every Zoroastrian revivalist, for every youth in north Tehran who spits at a passing bearded militiaman; for every exile who speaks in glowing terms of the shah; for every student in Shiraz who visits the bathroom with the words "I need to say hello to our President (Ahmadinejad)"— it is hard to escape the conclusion while travelling around the country that those who demand nothing less than the total abolition of the Islamic Republic are in a clear minority. Still, it is a minority that history and demographics would suggest is steadily growing. With the ostensibly pro-democratic upheavals in the Arab world in 2011, many were asking why there were no equivalent mass protests in Iran. In fact, in the earliest days of the Arab uprisings, Tehran witnessed a series of sizeable demonstrations. Two protesters, Sane Jaleh and Mohammed Mokhtari, were killed on February 14-15, 2011. Amazingly, the state-run media tried to claim that they were in fact pro-government activists and that they were killed by either anti-regime terrorists or supporters of Green Movement leaders Mir-Hossein Mousavi and Mehdi Karroubi—a quite ludicrous notion that was conclusively refuted by interviews carried out with the men's friends and family. Twenty, thirty years. If we all protest now, and don't give up, they will kill thousands of us. They don't care. They have all the power, all the guns, and they consider us traitors. They will kill as many of us as they want; they will win easily. There is a hard-line element of the Iranian population, estimated at anywhere between 10 to 25 percent, that is willing to die and kill for the Islamic Republic. Furthermore, this militant minority has a monopoly on political and military power. The genius of the Islamic Republic is that for every state and civic institution—parliament, judiciary, military—there is a parallel, unaccountable religious body to either mirror it or police it. The on-the-ground authority of the paramilitary Islamic Revolutionary Guards Corps and Basij militia exceeds that of the official Iranian military and police respectively. In short, the regime is strong and dynamic. Its byzantine political structure provides fundamental veto powers to any attempt at systemic, democratic change from within, and its sophisticated security and military apparatus dwarfs anything that could conceivably be mustered by the opposition. And there is no indication that the supreme leader and his circle of ayatollahs have any intention of "giving up one iota" of control over the reins of power. Indeed, just the opposite is true. In 2009, Ayatollah Khamene'i took the unprecedented step of publicly backing incumbent president Mahmoud Ahmadinejad's election victory against the reformist opposition and its claims of electoral fraud, declaring the victory a "divine assessment." Several days later, as protests continued to escalate, the supreme leader appeared to backtrack somewhat, announcing that he had ordered the Guardian Council to investigate the claims of fraud—who, of course, denied the claims. Virtually all serious commentators have alleged some degree of fraud in the elections. The accusations came not only from every opposition candidate but from numerous nongovernment clerics and from foreign journalists. Some results, such as Mousavi's loss in his own home province of East Azerbaijan, were too hard for many to swallow. But to what extent Ahmadinejad's victory reflected, or failed to reflect, the majority's genuine preference has been hotly debated. Polls conducted by Western organizations both before and after the June 2009 elections, showed anywhere between a 12 percent to 39 percent margin in favor of Ahmadinejad. However, such polls are themselves subject to a myriad of weaknesses, not least self-censorship. Still, the Guardian Council's alliance with the president turned out to be ephemeral. Ahmadinejad and his circle have never been true orthodox conservatives. Instead, he is a part of a "religious nationalist" current within the broader conservative milieu. Ayatollah Khomeini was famous for his anti-nationalism: "Those who say that we want nationality, they are standing against Islam... We have no use for the nationalists. … Islam is against nationality." In a Machiavellian twist, the president is now being derided as a "deviant" by the conservative establishment, accusing him and his inner circle of having messianic aspirations and of trying to usurp the supreme leader and the velayet-e-faqih. Ahmadinejad's closest friend and confidant Esfandiar Rahim Mashaei, whose daughter is married to the president's son, is particularly loathed by the orthodox conservatives and has even been jeered at by hardliners in the streets. It was the general opinion, both within and outside Iran, that Ahmadinejad was grooming Mashaei to be his successor (the presidency has a two-term limit). This now seems impossible. When Ahmadinejad caused outrage by appointing Mashaei as first vice president (one of twelve VPs), Khamene'i quickly ordered Mashaei to resign from the cabinet, forcing Ahmadinejad to appoint him his chief of staff instead. After being relentlessly slandered in the conservative state-run press, Mashaei has now been implicated in the largest corruption scandal in the republic's history—as have several of Ahmadinejad's other close associates. The antipathy does not end there. On November 21, 2011, Ahmadinejad's top media advisor and chief of the state-run Islamic Republic News Agency (IRNA), Ali Akbar Javanfekr, was arrested and handcuffed by security services in his own office. Reportedly, only a personal telephone call from the president secured Javanfekr's release. In the ultimate affront to what semblance of democracy the country has, in mid-October, the supreme leader casually remarked that the position of a popularly-elected president may be abolished "someday in the distant future" and replaced with a prime minister appointed by the parliament. These events mark a high point in Khamene'i's involvement in politics from which he is traditionally supposed to be aloof. With Mousavi under indefinite house arrest, and Ahmadinejad's faction despised if not decisively discredited in the eyes of the Guardian Council, it is hard to imagine what kind of reformist candidate might be allowed to run—let alone succeed—in the upcoming 2013 presidential elections. It has been a busy few months in Washington-Tehran diplomacy. First there was the FBI's revelation of a plot by Iranian nationals to assassinate the Saudi ambassador to the United States (and possibly bomb the Saudi and Israeli embassies), followed by a damning International Atomic Energy Agency (IAEA) report and Washington's promise of increased sanctions, then by the downing of a U.S. spy drone, and now, according to some reports, by placing the Revolutionary Guards "on a war footing" in anticipation of further escalation. Keeping all these recent developments in mind, it is easy to understand why the rhetoric in favor of regime change and confrontation has escalated in the United States. At a recent Republican Party presidential debate, Newt Gingrich argued that not only was regime change in Iran possible but that it could be accomplished within a year. Indeed, some of the Republican presidential candidates seem to have been trying to outdo each other in their willingness to use the "military option" to prevent Iran from developing nuclear weapons. The problem with this kind of posturing, and any possible campaigns of solidarity with the opposition, is the strengthening of the regime's already dominant "siege-mentality"—thereby forfeiting more credibility, in a domestic political sense, to the hard-line conservatives. The success of the elites running the Islamic Republic depends heavily on their ability to assume the moral high-ground for their domestic audience—regardless of how twisted their moral compass might seem to outside observers. Events like the seizure of the U.S. drone or presidential candidates hinting at invasion are huge propaganda coups for the regime. In the words of the pro-Western, antigovernment Parisa, a 28-year-old teacher from Shiraz: "I hate the government, but I hate more that [John] McCain would come over here and attack our country... Also, it would be a disaster. It would make Iraq look like nothing." Some argue that sanctions have the same effect of rallying the Iranian people behind the regime, but conversations with Iranians have not borne this out. Whether an Iranian is likely to place the blame for the sanctions on Ahmadinejad's hostile statements or U.S. and European hawkishness tends to depend on their preexisting political views. It is true that sanctions cannot do much to hinder the activities of the likes of the Qods Force, the external Iranian intelligence agency, or the "millionaire mullahs," but their loosening or tightening can be an invaluable pressure card against the regime. Brendan Daly is a journalist with extensive experience in the Middle East and conflict and post-conflict zones. BBC News, Nov. 8, 2011. Melik Kaylan, "How a Regime Change in Iran Would Transform the World," Forbes, July 24, 2010. Ervand Abrahamian, A History of Modern Iran (Cambridge: Cambridge University Press: 2008), chap. 6. Radio Free Europe/Radio Liberty, July 18, 2005. BBC News, Apr. 12, 2005. The Wall Street Journal, Feb. 17, 2011; Frontline, Public Broadcasting Service, Tehran Bureau, Feb. 16, 2011. Harold Rhode, "How Iran's Rulers Think about the Nuclear Program," Hudson New York, Dec. 15, 2011. Ministry of Foreign Affairs, Islamic Republic of Iran, Tehran, Oct. 9, 2011. Time Magazine, June 15, 2009. Press TV (Tehran), June 29, 2009. See, for example, Agence France-Presse, July 7, 2009; Reuters, June 13, 2009. Ynet News (Tel Aviv), June 13, 2009. "Iran: Public Opinion on Foreign, Nuclear and Domestic Issues," International Peace Institute, New York, Dec. 8, 2010; "Iranian Opinion on Current Issues," WorldPublicOpinion.org, Washington, D.C., Sept. 19, 2009. Mehregan Magazine (Washington, D.C.), Spring and Summer 2003, p. 16. Mohebat Ahdiyyih, "Ahmadinejad and the Mahdi," Middle East Quarterly, Fall 2008, pp. 27-36. The Guardian (London), Apr. 21, 2011. Reza Molavi and K. Luisa Gandolfo, "Who Rules Iran?" Middle East Quarterly, Winter 2010, pp. 61-8.
 insideIRAN (New York), Nov. 1, 2011. Amnesty International, London, Sept. 29, 2011. ABC News, Oct. 11, 2011; al-Jazeera TV (Doha), Nov. 19, 2011. Voice of America News, Nov. 10, 2011. BBC News, Dec. 1, 2011. The Scotsman (Edinburgh), Dec. 14, 2011. The Daily Telegraph (London), Dec. 5, 2011. The Wall Street Journal, Nov. 24, 2011. Paul Klebnikov, "Millionaire Mullahs," Forbes, July 21, 2003. Danny Postel, "The Specter Haunting Iran," Frontline, Public Broadcasting Service, Tehran, Feb. 21, 2010. Paul R. Pillar, "Inevitable and Unpredictable Regime Change in Iran," The National Interest, May 14, 2011. Related Topics: Iran | Spring 2012 MEQ receive the latest by email: subscribe to the free mef mailing list This text may be reposted or forwarded so long as it is presented as an integral whole with complete and accurate information provided about its author, date, place of publication, and original URL.